A new modern luxury eco-friendly self-catering house on the beautiful Hebridean Isle of Eriskay, with accommodation for up to eight people. Changeover day is Saturday. Check out by 10.00am. Check in at 5.00pm. For the comfort of all guests, the property is non-smoking. The popularity of Eriskay as a holiday destination means that accommodation can book out quickly. 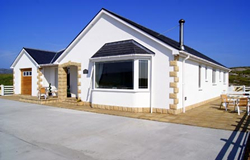 If we’re unable to accommodate you, then we highly recommend Aird Na Haun Self Catering Apartments. The house was designed by Roddy and Paul MacInnes (Coastal Homes). It’s a passive house, designed to be heated by solar gain and its inhabitants. The construction eliminates loss of heat, draughts and leaks. It has a heat recovery system for healthy living where you have flowing fresh air. This has huge benefits for hay fever suffers etc.